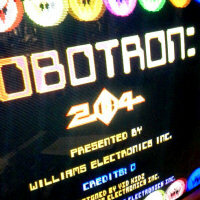 I love Robotron. You may have heard. Using Sean Riddel’s Williams Gfx Ripper application I scoured the Robotron arcade ROMs and pulled out all the Robotron sprites. While Mr. Riddel’s page had them already prepared, the image was a JPG, and thus basically unsuitable for my nefarious purposes. I re-ripped all of the enemy and player sprites, but cleaned up the fonts and electrodes. I also found a few sprites he didn’t: baby tanks, released from Quarks to grow and annihilate the player. And if you look closely, you’ll see the fonts are in there as well, so I added them to the arcade font engine.